Key IDs can be registered (linked) with either the M1 or M2 seat memory switches. The key ID registration procedure should be performed while the electrical key transmitter sub-assembly or door control transmitter assembly is in the vehicle, the ignition switch is ON, and the driver door is closed. When registration is completed, the buzzer will sound as an answerback. (a) Check the power door lock operation (See page ). Power door lock operation is normal. (a) Check the smart key system (for entry function) (See page ). Smart key system (for entry function) in normal. (d) Check that the buzzer sounds for 0.5 seconds and the mirror surface position is stored. 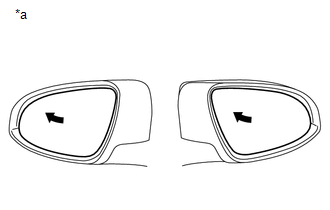 (e) Using the outer mirror assembly, turn the mirror surface to the fully right position. (g) Check that the buzzer sounds for 0.1 seconds and the outer mirror automatically moves to the stored fully left position. ON or OFF appears on the screen. (a) With the ignition switch off and the driver door closed, press and hold the M1 or M2 switch. The main body ECU (driver side junction block assembly) will enter electrical key transmitter sub-assembly or door control transmitter assembly recognition code registration mode to allow a key to be linked to mirror surface memory position. (b) When the manual door lock switch is pressed, check that the buzzer of the front power seat switch LH sounds once (0.5 seconds). The buzzer sounds when registration is completed. (a) Enter the following menus: Body Electrical / Main Body / Data List. (b) After performing any of the following procedures to cut the link between the key and switch, check that the Data List for the applicable key changes to NONE. (c) With the ignition switch off and the driver door closed, press and hold the SET switch. The main body ECU (driver side junction block assembly) will enter electrical key transmitter sub-assembly or door control transmitter assembly recognition code deletion mode. (d) When the manual door lock switch is pressed, check that the buzzer of the front power seat switch LH sounds twice (0.1 seconds each time). The Data List display for the applicable key changes to NONE. (a) After performing any of the following procedures to link the key and a switch, check the Data List to confirm that the key and switch have been linked. (b) With the ignition switch off and the driver door closed, press and hold the M1 or M2 switch. The main body ECU (driver side junction block assembly) will enter electrical key transmitter sub-assembly or door control transmitter assembly recognition code registration mode to allow a key to be linked to mirror surface memory position. (c) When the manual door lock switch is pressed, check that the buzzer of the front power seat switch LH sounds once (0.5 seconds). Data List shows that the key ID has been linked to a switch (M1 or M2). (b) Perform Active Test according to the display on the Techstream.